I'm not one to make resolutions. Instead, I'm a person who believes that a new year means a fresh start. It's a chance to make better life choices and simply improve a life that is already well loved! Resolutions are binding and can be broken so easily. They NEVER work for me! So I choose to set goals for the year and choose a word to live by. If I don't meet every goal, it's not that big of a deal. But those goals and that one word gives me something to strive for! 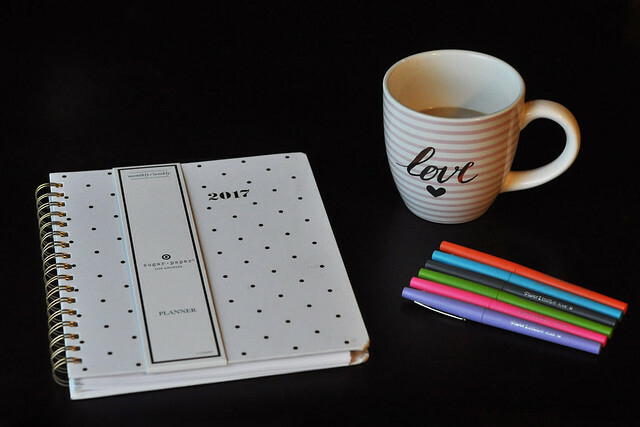 For 2017, I created a list of goals for all areas of my life: Personal, Home, Blog and Family. I thought of the things that I wanted to change in my life and brainstormed all the ways my days could run more efficiently. I ended up with so many goals in each category, so I had to narrow it down to a top ten in each category! After I wrote down my list of goals, it was time to come up with a word to live by this year. At first, I was certain I was going to go with organize. If I could just organize every aspect of my life, things would run smoother and I wouldn't feel as stressed. I quickly realized that I'm constantly organizing everything and it really isn't helping my stress level one bit. I tried to think of the area in my life that I struggle with the most, and two words popped into my head: Finding Balance. BALANCE. I struggle with this daily. No matter how hard I try, I can't seem to find the perfect balance between taking care of four kids, running a home, maintaining a blog and social media, making my husband a priority, spending time with family and friends, and taking care of myself. I'm not quite certain I will ever find the perfect balance. Just when I think I have it all figured out, something changes, and I have to start all over again. But I'm going to try. I'm going to focus on one word this year and that word is balance! Spend more time reading books like I used to. Make using my planner a priority. Plan more dinners with extended family and friends. Run and lift weights 3-4 times a week. Finally finish the main bathroom renovation. Set up a more functional playroom in the basement. Work on all of those fun backyard projects for the kids. Make it a habit to unplug electronics and appliances when they aren't being used. Create a cleaning checklist and a declutter one thing each week checklist, and stick with it! Continue to meal plan, maintain a running grocery list and start making Crockpot Freezer meals for those busy nights. Go through my reading list each weekday morning. Create a new theme and clean up my sidebar. Switch to a new email. Reach out to companies I love for collaborations instead of only collaborating with those who reach out to me. Maintain a blog idea journal and jot down notes as I think of them. Carve out time to create content and write during the day and on weekends after the kids go to bed instead of staying up until 4 AM to blog. Spend time each week scheduling posts on social media and share more posts from fellow bloggers. Schedule a block of time to reply to comments and emails each day. Update the list of chores for each child. Learn to delegate more instead of doing it all myself. Get rid of items that we don't need. Throw away, donate, give away or sell. Create a functional, organized living space in each room. Attend more events instead of getting caught up in the busyness of everyday life. Start going on hikes together as a family again. Finally plan all of the day trips and weekend trips that we have been talking about for years! This list may seem daunting, but I plan to read it each day to stay on track. I'm realistic and I don't expect to reach every single goal every single day. (If that's the case, I failed already!) Hopefully, I will achieve most of my goals and end up finding a good balance for all of the areas in my life! Did you make any resolutions or goals for 2017? 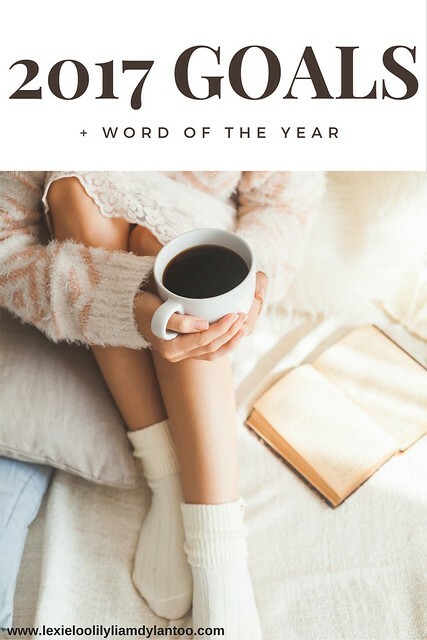 If you had to choose one, what would your word of the year be? Balance is such a great word for 2017! That is something I need to be better about as well. It's so tough. So many of your goals are things I'd like to accomplish too, though I don't stay up until 3-4 in the morning. I would be a very mean person the next day. Ha ha!! That seems to be a struggle for so many! HA! I can run well on 3-4 hours of sleep, but it's not exactly healthy. That's why I'm trying to head to bed earlier more often! I love all of your goals so much! I can relate to so many of them and they should totally be on my own list (which I have yet to make) Balance is a great word and sounds perfect for your 2017! I love your goals! My word and goal is declutter. I started with the laundry room and I'm thinking the other rooms are going to be much more difficult! Your list of goals is great! So many of those things should be on my list as well! Your list is so big yet touches on parts of your life that are so important to you! I can't wait to see what the new year brings. You have some pretty fantastic goal ideas for 2017 friend. I can't wait to see them all unfold. Great list! The word, balance - oh my gosh, yes! My words would be simplicity and creativity. But, balance. Oh balance is a goooood one! I personally love the robotic vacuum idea. It doesn't sound lazy at all. It'll just save time. My friend has one and another girlfriend of mine and I sat there the other day at watched it do it's thing. It was amazing. I was also told that there's a mopping one, too? Say whhhhaaaat?!?! I really love these goals! It's a big list, but lots of important things to keep in mind throughout the crazy days of life. Such a good word choice, friend! Your list of goals are are pretty spot on, too. I need to sit down and right some for myself, too. I completely love your word! You can do it, mama! I'm excited to see more lifestyle posts here, your family is darling!! I love these goals. A monthly date night would be huge for us! We have a Roomba and man, I love it! I feel like you and I have the same list :) I can really just steal yours and call it a day, haha. Just kidding. After Christmas, my hubby and I went on a major cleaning spree and donated 10 kitchen trash bags worth of stuff! and that was JUST going through 2 rooms upstairs. That didn't even touch the downstairs stuff. My goal this yer is to get my house organized! I got this! Actually I should have said, We Got this! Balance is what I'm wanting to achieve this 2017. Love all your goals and everything you want to accomplish I can genuinely relate to so many myself as well. Getting out the door on time and being prepared every morning is a big goal of mine! Wow, this is inspiring! I only had 8 goals and I thought that was a lot. I need to implement some of these too - like waking up earlier and reaching out for collabs. Awesome goals!! I have a lot of similar ones! I love the idea of buying one small gift a month! Brilliant. Have you ever gone to the website ApartmentTherapy.com? They have tons of cleaning lists and schedules, that is where I get all of mine and they're so helpful! I think balance is key and a new year means you get to start with a clean slate in my book! I could not love this post more!!!! I'm a list girl, and I had aaaallll the heart eyes when I pulled up this post! I'm working on my list now as well to hopefully have up next week and it looks like we have several similar items. And I know that you said your word for the year is balance, but goodness gracious, you already seem to know how to balance it all! The amount of things you accomplish on a daily basis never ceases to amaze me! I can't wait to watch you grow in 2017! I have some big goals for my blog for 2017 and it's always nice to follow along with my favorite bloggers for inspiration! I couldn't have said it better about resolutions and I absolutely love the lists that you made! I'm encouraged to do one for myself now!